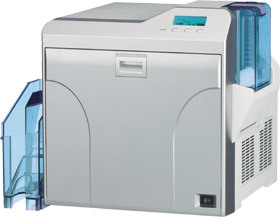 The DNP CX-D80H Retransfer Card Printer is the culmination of the technological development and is the most innovative card printer available for all types of card-issuing applications. Succeeding to DNP legendary CX printers, the CX-D80H has a thermal retransfer-printing engine, of which quality and reliability are acclaimed by users worldwide. Ideal for gift cards, on demand ID cards and for corporate and governmental ID card, the CX-D80H provides the integration of proven, long-established technology with a compact and user-friendly body. Due to policy of continuous development, we reserve the right to alter details of specification and equipment without notice.